What are the Best Tips for Installing Plastic Lawn Edging? When installing plastic lawn edging, a motorized garden tiller may be used when making the installation trench. Plastic lawn edging can provide an underground barrier against grass and weeds for many years when installed correctly. There are several tips that can improve the installation process. Use a good grade of plastic lawn edging at least 6 inches (15.2 cm) tall and dig a deep installation trench to prevent weeds and grass from growing under the barrier. After unrolling the edging, face the outer edge of the curve towards the lawn and be sure to install any connectors evenly. Install the plastic lawn edging nearly flush with the ground to allow for mowing, and use a sufficient number of anchoring stakes attached at a right angle. It is usually best to purchase a commercial grade of plastic lawn edging rather than an economy type. The high quality materials found in commercial edging generally last longer. The edging should be at least 6 inches (15.2 cm) tall to keep grass and weeds from making their way underneath the material and into the garden. A wide, deep trench should be dug prior to installation to accommodate both the edging and anchoring stakes. 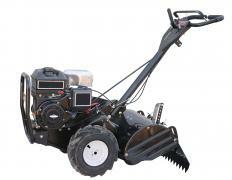 A motorized garden tiller may be used to break up the ground for the installation trench. Plastic lawn edging typically has a natural curve from being packaged in a coil. Most types of edging also have a V-shaped notch at the bottom. Place the plastic lawn edging in the trench with the outer curve and V-notch facing toward the garden to prevent displacement caused by ground frost. Make sure that the plastic connectors are evenly spaced inside each section of edging to avoid future separation from frost. Special corner connectors are available for joining edging pieces at right angles. Properly installed plastic lawn edging should be slightly above ground level. Lawn edging is designed to stop grass and weed roots from entering the garden from below ground, but has little effect above ground. Edging installed too high may become damaged by lawnmowers or motorized grass trimmers. Anchoring stakes should be attached every 7 feet (2.1 m) beginning at one edge and ending at the other. Anchoring stakes must be installed at the correct angle in order to properly secure the edging. Drive the stakes into the edging at a right angle facing toward the lawn. It may be necessary to widen the trench on the garden side to accomplish this angle. After the stakes have been installed, backfill the trench and thoroughly water the soil to compact it. Fill any depressed soil areas and water again. What Is an Edge Connector? What are the Different Options for Path Edging? What are the Best Tips for Edging a Garden? What are the Different Options for Lawn Edging?